There is no single proven effective technique to answer this question, unless it’s Chameleons in Madagascar, in which case you just pick them off the trees! During our Oman expeditions we are faced with the challenge of catching some seriously nippy lizards. To top it off, the environments in which we try to do this are unfavourable for quick mobility. If only we humans were armed with the adhesive setae of a geckos’ specially adapted toe pads…*sigh*. On our return next year, however, we will be packing an arsenal of simple but hopefully somewhat effective lizard catching methods in order to shed some light on the rich variety of species hiding away amongst the caves, crevices and boulders of Wadi Sayq. The benefits of actually collecting individuals are indisputable. Once in the hand, measurements and photographs can be taken of the morphological features of the individual, and so adding to the global database of identification knowledge for that particular species. This is of specific importance in the Dhofar Mountain Range, and Arabia as a whole, because this data is simply too few and far between, which puts more specialised studies on hold. Indeed, there are groups of lizards present in Wadi Sayq, and throughout Dhofar, still under taxonomic investigation with new species and subspecies likely awaiting discovery. It is an exciting prospect, and one we will embrace with gusto. Hands and lightning-fast reactions – As impressive as it sounds our results have shown it remains somewhat ineffective. The bottom of the wadi is littered with boulders (some as big as houses), which have been deposited by the monsoon torrents. Once spotted, a lizard has a 99% chance of evading capture with this elementary method. The only exception is the miniature Pristurus species which measure just a few centimetres long but even these can disappear in the blink of an eye. A net and lightning-fast reactions – An improvement on the above with a higher capture rate. Found to be more effective on cave dwelling gecko species but only once you have managed to disrupt the impressive ‘van der Waals’ force between their feet and the cave walls. Simply not quick enough for the Agamids, but the net can be handy for use as a temporary lizard holding facility while mutual congratulations are exchanged between the researchers post-capture. The Pitfall Trap – A much more hands-off approach but requiring high initial input. Buckets are dug in to the ground in a linear arrangement at given intervals. A low net or tarpaulin fence, known as a ‘drift fence’ is then erected connecting the buckets. The idea is that lizards or indeed any small ground dwelling critters that are passing through the area are gently guided into a bucket and collected by researchers each day. Can be highly effective if constructed in a habitat with high lizard abundance, but requires regular attention and often extra construction work such as shading for buckets or terrain levelling. Individual buckets can also be buried into natural gravel dips in the wadi bottom. A technique which awaits trials in 2013. The Lizard Noose – Inspired by ancient aboriginal traditions, whereby stems of tall grasses were used to capture small lizards while they basked in the sun. The end of the grass stem was chewed to rehydrate and add flexibility, before being tied into a sliding noose-knot. When approached carefully, the noose could be slipped over the head of a basking lizard, which was then skilfully plucked into the air towards the hands of the collector. Nowadays, the concept remains the same for ecological surveying, however, a telescopic fishing rod with a dental floss noose-knot tied to the end is the setup of choice for most researchers. A highly effective and widely used technique which we will implement during the 2013 expedition. Its high success rate is speculated to be due to the fact the lizard is paying more attention to the approaching researcher than to the dental floss dangling above its head. Know your lizard – different species will behave in different ways; skinks are fast and shy; agamids are bold and curious, teasing you till the last minute, then emerging to watch you from a crevice; and geckos rely on camouflage, moving only at the last second in short, smooth bursts over the rock face. Know your habitats – Anticipate which species you might expect to find hiding around the corner, often your foresight will pay off, provided you can catch the little tinker. Turn over rocks – but be warned you might get more than you bargained for when a viper reverses out, scales sawing. 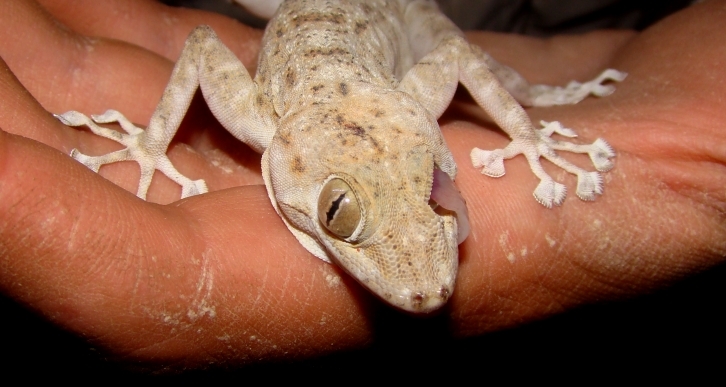 Use your torch at night – Not only will you be able to spot the eyeshine of geckos but a whole different community of lizards will be out after dark. Often these nocturnal species are relatively easy to capture compared to their diurnal cousins. In addition your torchlight may bring the lizards to you, if you can attract enough lizard food! Ninja – Use the slowest, stealthiest and most non-threatening posture you can achieve when approaching a lizard – be a ninja. So for next years expedition we will enter Wadi Sayq with (to quote Gillette) ‘the best a man can get’ when it comes to surveying for lizards. Yet in comparison to our robust and reliable methods for the other fauna I can’t help but feel the lizards may still have the upper hand!? If anyone has any advice, or a proven method, perhaps a black-market approach reserved for the ears of the herpetological elite, then do please let me know in the comment box below. I enjoyed this article, keep up the good work.